Remember when we use to play on see-saw’s on the playground? I can’t remember the last time I’ve seen one at the park when I take my son Jake. I’m sure that someone’s kid got hurt and tried to sue some company so they took them out of the parks. I know that they make a safer version then when we were kids but they just don’t have them at the playground anymore. I’ve had some interesting growth opportunities with my business lately – started on a 90-day sales training program at Sandler Sales Training and then began working with a business coach. I see both as a great way to take my business to the next level. Ironically, both got me thinking about the changes that I’ll need to make to push past these business behaviors (and most likely my personal beliefs) that aren’t working for me. As each program keeps moving forward and causes me to reflect on my life, I’ve experienced days of feeling excited and other days of feeling unsettled. 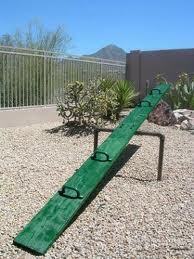 You’re probably asking, what does this have to do with a see-saw? Well, I started thinking about see-saw’s the other day, how it related to my Quest for Balance and how I view my life. You know when you’re on the see-saw, you never really sit in the middle, the part of the analogy where I’d consider the “balance.” That’s where the thing was attached to the bar that held the see-saw and really, you could get your hand caught in the hinge if you tried to hold on to it (oh the mommy in me comes out!). You had sit on either end, go up and down and hold on to the bars to make it work. I’ve been struggling to find a way to “balance” all the pieces of my life when really I should accept the fact that life is really just a see-saw. If we want to ride on the see-saw of life, we have to go up and down. When we accept that we’ll always have times when we hit the ground, we know that we need to brace ourselves and plant our feet firmly on the ground so the see-saw doesn’t slam our butts into the board. Then to get us back up in the air, we push as hard as we can against the ground. And when we’re up in the air, our feet are dangling, we can see the whole park and the tops of the trees … we feel that high of being so far up in the sky. You feel the thrill of the rush and the power of being above the ground. But then, back down you go when the other person pushes you back to the ground. And its OK because you know that the ride isn’t over and you’ll get back up there again. We all know that you can’t really ride the see-saw alone or you’ll just sit on the ground. You need another person on the other side to ride with you to help push you up into the air. It’s that support system that I’m always talking about. And isn’t that what life is all about? It’s the ups and downs, hitting the ground and then flying back up into the air and always knowing that someone is always there on the other side of the see-saw, supporting you and helping to push you back off the ground. Maybe they should figure out a way to bring the see-saw’s back to the playgrounds. I think kids would be better off if they learned firsthand just how great it is to experience life on a see-saw. For those of you following the story of my dog Woodrow, he was put to rest last month and I did a special blog post to remember him. Yep, this really speaks to me too. Love the analogy.